Trying to find a darling way to give someone chocolates or a delectable treat? This project could be for you! 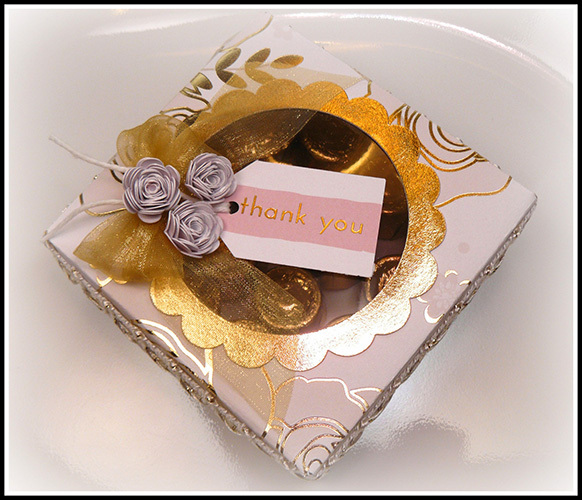 Cut out the favor box using the Cricut Sweet Tooth Boxes cartridge and patterned cardstock from the Blush Stack. Cut out a scalloped circle from the Modern Metallic stack to fit over the window. 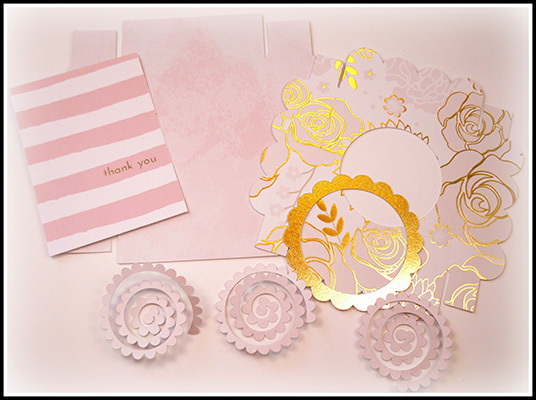 Cut out 3 flowers using the Cricut Flower Shoppe cartridge and the same paper used for the inside of the box. 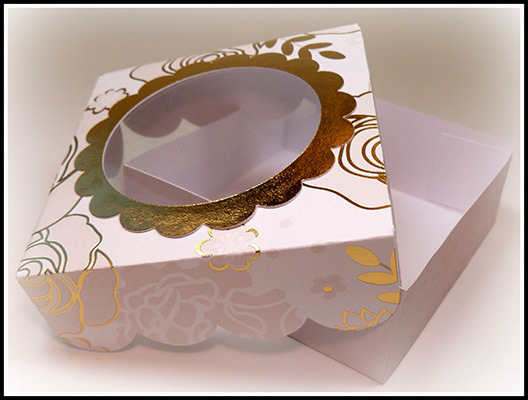 Fold the box base and lid along the scored lines; adhere each one separately together with double-sided adhesive. Adhere the scalloped circle around the box lid opening. Adhere the clear acetate below the window. Roll each flower together one at a time, securing each one in place with adhesive. Tie a bow using one of the ribbon strips; attach it to the side of the window. Attach the flowers on top of the bow. Cut a tag from one of the prints in the stack. Punch a hole in the top, add some twine, and layer it into the flowers and ribbon bow. Adhere a strip of the other ribbon around the sides of the box lid. Insert a treat and share it with a friend! Don’t have access to a Cricut machine? Find another box template online. Try using more than one print (we used 3) to create the box. The box shown was sized at 5-3/4”.